They say that the word tango is older than the dance itself and that by 1803 it would appear in the Real Academia Española dictionary as a variant of tángano, a bone or rock used to play the game bearing the same name. But by 1889, the institution ruling over the Spanish language would include a second entry for the word "tango" as a "popular celebration and dancing of black people in America". However, almost 100 years had to pass for the dictionary to define tango as a "world-wide known Argentinian dance for two people who join in movement, based on a binary 2/4 beat". Other scholars of this musical expression argue that the term derives from the African tongues that arrived in the River Plate along with the slaves and which would mean "closed space". The word tango may also have a Portuguese origin and may have been introduced in the new continent through an Afro-Portuguese Creole dialect. When comparing tango and tambo, Blas Matamoro asserts that these two terms are onomatopeyic of the tam-tam or candombe used in African dances. Even more, in the bozal dialect, the expression was "tocá tango" or "tocá tambó" (play the drum) to start the dance. The slaves' meeting space, both in Africa and America, was called tango. And Buenos Aires gave that name to the houses in the suburbs where, in the early XIX century, the African would meet to dance and forget their condition for a while. Controversial even in its origins, like every real thing, it hides a secret. The voices fixed to your fate are born from the underworld. If your cradle was a brothel, if you come from the milonga and the habanera, created by a god from the outskirts, you have left this place to provoke the world. Its date is not precise and its origins are even more uncertain. There are theories that refer back to its black roots and others that assert its immigratory origin. The truth is that in the mid 1800s, the well-known conventillos (large houses inhabitted by several families) in the booming city of Buenos Aires would be crowded with countrymen, foreigners who had just descended from a boat and several porteños without any means of support who, maybe in order to make a difference or perhaps to take root, set their own stamp on the new popular expressions. A mixture of closed codes and having a particular language, the tango would germinate in the dancing houses, by the Riachuelo, the carters and horse caretakers shops and in the southern end conventillos. In those days, many of the immigrants would come along on their own and the few women that would come to Buenos Aires used to be in the academies or the dating houses. In the 1880s, Buenos Aires would be revealed little by little in the academies and the theaters. In the comedies, zarzuelas and other plays, the actors began singing and dancing tango. The academies, also called peringundines, would work in the suburbs or neighborhoods located in the outskirts of the city only under a certain kind of authorization and, even if in principle they were only for men, women were hired for dancing later on. The guapos, compadritos and malevos would meet at the Café Sabatino, the Almacén de la Milonga and the Viejo Bailetín del Palomar. The boliches located on Necochea Street at La Boca neighborhood began to play this joyful, youthful and mischievous music based on a binary 2/4 beat and performed by Rosendo Mendizábal, Eduardo Arolas, Angel Villoldo and other self-taught musicians that would compose without even knowing anything about scores. The tango stopped being exclusive from the suburbs to gradually get deep into the core of the city. The street organs would spread it across the neighborhoods where it was normal to see male couples dancing in the streets. Essentially porteño, many writers consider that the tango from the late 1880s would combine various music styles. It would imply the choreography of the milonga, the rhythm of the candombe and the melodic, emotional and sentimental line of the habanera. But it also received the influence of the Andalucian tango, the chotis and the cuplé, in addition to the town payadas and the Creole milongas. 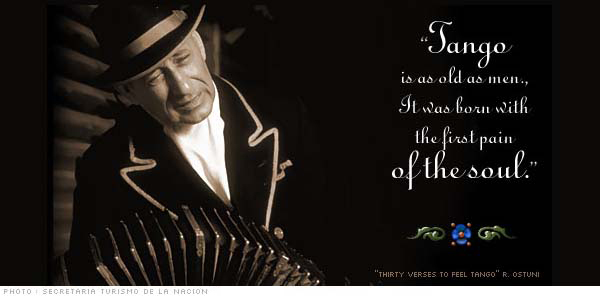 It is believed that the first tango composer was Juan Pérez, author of the tango called Dame la Lata (Give me my pay). Nevertheless, it is quite likely that there have been previous authors and songs. In addition to Pérez's work, the first compositions were El Tero and Andate a la Recoleta (Go away to Recoleta). Even if its origins still cause controversy at the tango coffee tables, the world-wide prestige and recognition it has acquired is unquestionable. As every authentic artistic expression, the tango unravels our inextricable human condition, revealing the porteño spirit. Maybe it is due to this reality that it lives in the Buenos Aires neighborhoods and at the academies in Japan, in the streets of Paris and in the New York cultural centers.